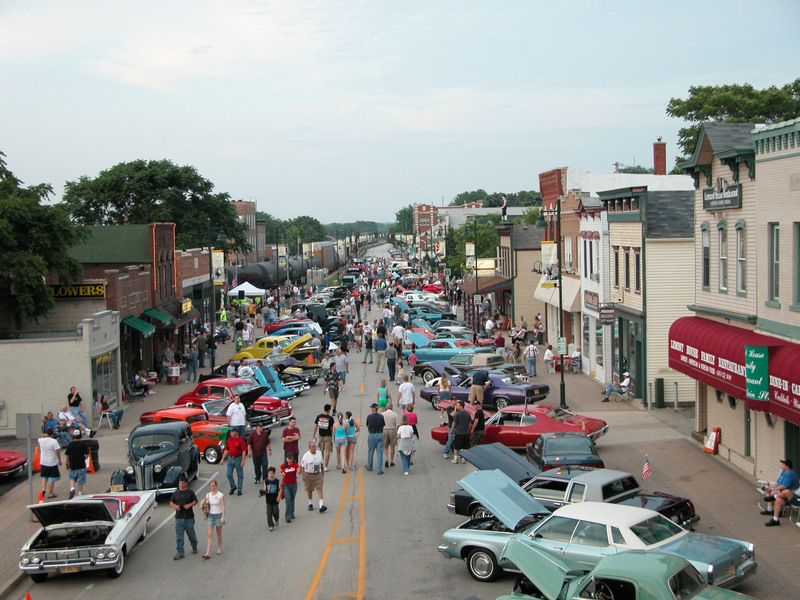 Cruise Nights are a weekly summer tradition in Lemont. Crowds come from around the area to admire classic cars in historic downtown Lemont. Lemont, Illinois, (population 16,625) was first settled in 1836. The village’s origins are inextricably linked with the construction of the Illinois and Michigan (I&M) Canal, which was begun the same year Lemont was settled, and completed in 1848. The I&M Canal represented a revolution in the transportation of goods and people, linking the Illinois and Mississippi rivers with the Great Lakes for the first time. While digging the canal, workers discovered an excellent grade of Dolomite limestone just below the topsoil. The resulting quarries became Lemont’s primary industry until the turn of the century. Some notable buildings constructed of Lemont-Joliet limestone include the Chicago Water Tower, Holy Name Cathedral, and the Illinois state capitol building in Springfield. By 1912, the I&M Canal was abandoned, replaced by railroads and the much larger Sanitary and Ship Canal. Industries that relied on rail and barge transport continued to thrive along the new canal and rail lines. Although long abandoned for industrial uses, the I&M Canal and the limestone quarries still serve as focal points for historic Lemont. The Lemont Heritage Quarries Recreation Area is a 100-acre pristine nature park featuring a 3.8-mile hiking and biking trail. The former limestone quarries are now clear freshwater lakes used by boaters. Downtown Lemont celebrates its heritage through the preservation of its historical buildings, most of which now house shops and restaurants. The Lemont Historical Society is situated near the heart of Downtown in Lemont’s historic Old Stone Church. The society’s museum is open five days a week, and the group offers walking tours of historic downtown Lemont.